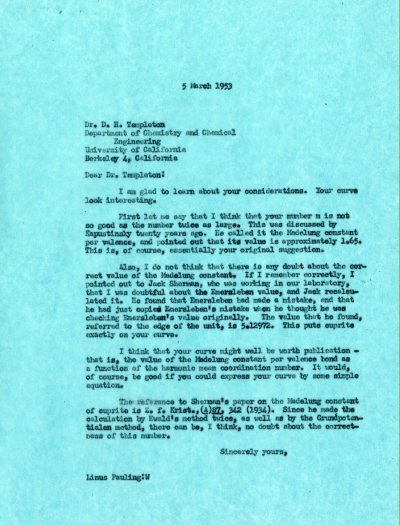 Letter from Peter Pauling to LP and AHP. [Filed under LP Biographical: Box 5.041, Folder 41.6]. Many thanks for your letters. I enjoy them very much. You are coming on Easter; J.C. Kendrew won’t be here, but that is all right. Max, Bragg, & most important Francis Crick will be here. I like the Cricks very much. I now go there for lunch on Sundays, which college does not supply. Might you be in need of a chauffeur, mechanic, linguist, travelling companion, navigator, oil line break repairer, tire changer, witty conversationalist etc. on your trip next summer? I know just the fellow. Good friend of mine. While I cannot give an unqualified recommendation, still... Who is to sit in the other two seats? I can account for only two occupants. We were all excited about the nucleic acid structure. Many thanks for the paper. Alfred Tissière arrived. He is very nice. Has a big Bentley (old). He went to Alaska with Gunnar and Beadle. Nice, lovely sun today. Second sunny day since I have been in England.